I'm re-reading Hundred years of Solitude. last time I read it I was at a very interesting stage in my life, I think it gave me allot of missing perspective. I spend my summer days sitting in my office chair on my flat's balcony reading books instead of studying for exams. I feel I'm not missing out. I was asked once what book I would choose if I could only leave one book to a reborn humanity. I chose Hundred Years over Newton's Principia. So this is my chair where I read. 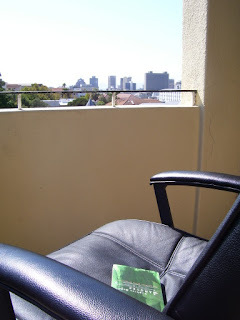 I sit in it and look over Cape Town and don't learn much about computers. My tan is probably better than my class mates though. When I finally understand the last lines of the book, I think I'll get them tattooed onto my thigh. Above my shorts line.